Am I A Raison Head? : Why avoid foods rich in phytates and oxalates if the lactic acid of sauerkraut does such a good job at neutralizing these calcium absorption inhibitors? Am I A Raison Head? Why avoid foods rich in phytates and oxalates if the lactic acid of sauerkraut does such a good job at neutralizing these calcium absorption inhibitors? Alternate Title: Preventing Tooth Decay with Sauerkraut! The hardest problems to overcome are those born of our ignorance - our errors of omission, rather than our errors of commission. I find the lactic acid of sauerkraut to be so powerful at overriding calcium absorption inhibitors that I see no reason why I should avoid foods rich in phytates or oxalates, such as: oats, brown rice, beets, spinach, etc, if I include sauerkraut in my diet everyday? Nor do I avoid beans for this same reason. Of course, I don't limit myself to just sauerkraut to satisfy my craving for sour foods. I try and include a mix of other foodstuffs rich in the other natural acids, such as: sour apples (malic), sour grapes or cherries (tartaric), and lemons (citric). Being a vegan (most of the time), I find it essential to not restrict myself any further than I already have. And I certainly don't stay away from a good methylated B-complex. And I include seaweed for trace minerals everyday. Nor do I avoid salt. I just don't eat the stuff. Awk! I bathe in salt, instead, along with MSM and silver hydroperoxide (AgOOH) made by taking colloidal silver and reacting it with food grade hydrogen peroxide until I get a non-fizzy clear liquid. I wouldn't want to drink AgOOH, either, since it is an oxidizer not unlike bleach. But soaking in a bath with it using well water from our tap sure beats municipal chlorination, or -worse- chloramination. Yuck! Failure to methylate appears to be a major contributing factor for several malabsorption related diseases according to Autism Coach. That's why I use a methylated B-complex and methylated MSM variety of sulphur instead of the cheaper quality of cyanocobalamin B12, or the unmethylated sulphur in Epsom salts. But I wouldn't give up my veganism just because it appears to be unnatural to take a B-complex supplement to survive the prospect of nerve degeneration due to lack of B12. I know that it is unnatural to not have a victory garden nourished by my nightsoil and get some of the B12 manufactured by my colon by failing to wash off any dirt adhering to root vegetables, etc. I can make my own B12 in my large intestine, but can't absorb any of it unless by some means or another it should reach my small intestine in a somewhat hygienic format (such as the result of biological processing from soil bacteria). So, without a garden plus composting, I make do with a vitamin pill. Oh, well... The hazards of modern life.... Could be worse. Lead and beryllium aren't elements I'd usually think of as nutrients, let along essential nutrients, but there it is... All six are candidates for bone formation whether or not any one of them are toxic by themselves. Of course, argyria does not indicate toxicity of silver and more than the presence of oxalate or phytate indicates toxicity of spinach or oats. It's a lack of absorption of silver or oxalates, not their mere presence, which indicates a problem. Oxidation of silver is the solution to argyria brought about by a transference of electrostatic charge rendering oxidized silver more electronegative than the electropositivity of metallic silver alone. Hydrogen peroxide is the means whereby a negative net charge can be transferred to nano-sized particles of silver easily rendering metallic silver safely bioavailable for cellular absorption unlike silver salts which have no net charge, of either polarity, to contribute to silver's excessive ionization. Excessive is not a bad word in the context of bathing in excessively ionized silver. Although AgOOH is an oxidizer, it has its place in the bath among its supportive ingredients of MSM and salt. And argyria is worth avoiding if for no other reason than to prove the silver naysayers wrong. I no longer eat sauerkraut. I hunger for sour fruits, instead, such as: fresh oranges, lemons, etc. I find that consuming beeswax with silver soot embedded in its shavings along with a cold breakfast cereal, such as: granola, is even better than whatever digestive assistance eating sauerkraut had given me. It's weird. Sauerkraut tastes strange to me, now. Tesla's Special Generator: A Tri-Metal Arrangement of Copper, Aluminum and Iron. 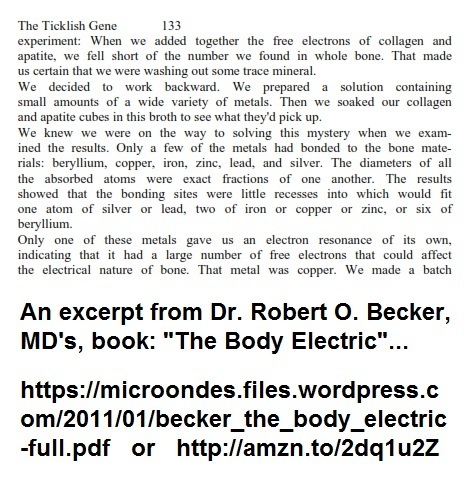 The Regeneration Expertise of Dr. Robert Otto Becker, MD, is within our Reach as DIY Homemakers. Design Characteristics of Tesla's Special Generator. Sweets hand-dipped in beeswax/oil blend.